Box Dimensions (LxWxH) 5.9 x 3.6 x 1.3"
Wireless Remote Commander is rated 4.4 out of 5 by 104. Rated 5 out of 5 by Jamie from Works great on my a9 and a7R III I was looking for a wireless solution and this fits the bill. Yes, I can also use my iPhone via the PlayMemories app, but in that app, it will copy images to your phone as you take them. When I am capturing fireworks, I need to continuously click and this works great. It also works perfectly in bulb mode but a bit different than you might expect. Instead of simply holding the shutter button for a user-determined long-exposure, you press the shutter once to start the exposure and press the shutter a second time to release the shutter. The biggest challenge was finding the menu setting on both camera bodies that enables the "Remote Commander." A quick Google search solved that problem. Rated 2 out of 5 by JT from Could, Should, Be So Much More Disappointed. Everything in the Sony A65's manual speaks to supporting an optional 'wireless' controller. When you read product description, it is referred to as a 'wireless' controller. The reality: It is infrared. Is it technically wireless? Yes, it is. However in today's world 'wireless' means something completely different than does 'infrared'. As a result, this is -purely- a line of site remote. And, since the camera's sensor is front-facing, that means you cannot use it unless you are yourself standing in front of the camera. If you are big into 'selfies' than this is the remote for you (as long as you don't mind it being visible in the photo (it is line of site after all). For serious use, you still need to simply use the conventional cable option if you plan on standing behind the camera. I played with this briefly, realized what it was, and haven't touched it since. My bad? Perhaps. But I honestly believe this is an intentional effort on Sony's behalf to pass something along in a rather deceptive fashion. Rated 5 out of 5 by Holt from Sony Remote, RMT-DSLR2 I purchased the Sony remote, RMT-DSLR2, to use with my Sony NEX7 for long exposures using bulb mode. The remote worked as advertised even when the remote was not directed to the camera's sensor on the front. The remote eliminated any vibration caused by manually holding the shutter button down for long exposures. The problem however, was that the auto focus failed in many cases to detect the subject (fireworks). I should have set the camera to manual focus lock. The remote will work well with group pictures including the photographer. Rated 5 out of 5 by Piano Protector from Big Help - especially for silent mode with slow shutter Best thing - it works! I'm using a A7RII. Allows me to get the most out of my electronic shutter (silent mode). Very simple to use, responds even when not aimed at camera almost always. Although I use my Note 3 with playmemories remote a lot, this dedicated remote is a lot simpler to use and more reliable. Oh, and I almost forgot, super inexpensive (I almost thought it was a mistake. One minor issue - I own a Sony FDR100 camcorder. I also own the camcorder's remote control. Both camera and camcorder are affected by both remotes, so care is needed if I use both devices on one shoot not to trigger the wrong device. Ah, if only this was he world's greatest problem! Rated 5 out of 5 by Lester from Great with the a6000 Although a bit oversize due to the TV functions I'll never use, it does more and works better than I expected. Although the camera's sensor is on the right front, I still can trigger it from somewhat behind when at a distance of about 2 feet. Otherwise, face-on I can trigger the sensor to about 30 feet. (Why a sensor isn't on the camera's back as well is beyond me.) The red button turns on the movie mode; a second press stops the movie. You do not have to put the camera in movie mode to activate it. At least when the camera is tripod mounted, this is so much better than having to press the button on the camera. Pressing the remote's shutter button obviously trips the shutter, but to my surprise, with the camera in bracketing mode, one press of the shutter button generates all five (or three) bracketed shots. The remote will not, however, work in the camera's Continuous-shooting mode. Even with the camera set to Continuous, you get only one exposure per press of the remote's shutter button. Semi-obviously, the 2-Sec button on the remote means there will be a 2-second delay before the shutter fires. Rated 4 out of 5 by Jim from Remote design is good - A7R2 sensor/receiver issue The remote has a nice simple layout and works great, but Sony needs to move the sensor/receiver (on the camera) to the back of the camera on the A7R2 or at least put a second sensor/receiver on the back. It will trigger the camera from the back, but only from about 10-15 feet away (indoors). I have not tried the remote outdoors yet, so I am not sure it will work at all if you are trying to trigger it from the side or from behind the camera. I think the only reason it works indoors is because the signal is bouncing off the walls and somehow getting into the front mounted sensor. Rated 3 out of 5 by Scott from Only Top Two Buttons Operate Camera What they don't tell you is only the top 2 buttons actually activate the camera in photo mode. This is basically a Home Video Remote control to use with the camera hooked up to a TV using the mini HDML cable, so it's sitting in my living room, and not in my camera bag. If you need just a shutter and 2 second delay, buy the 2 button simple version for under $10. Rated 4 out of 5 by Denis from An annoying design flaw that is easily fixed The device is fine but its small size makes it very easy to misplace. How could Sony design the case without an attachment spot for a light neck strap (like the ones found on inexpensive IR triggers)? This is easily fixed in a minute by opening the battery drawer, looping a short length of nylon monofilament around its locking mechanism, and locking it back. A 12 lb filament is small enough that it passes through the slot without impairing the mechanism. Close the loop with a knot and attach a strap of you choice. I can't get mine to function with my a7R. Works fine with my a57 and a99. They both have Drive Menu options for wireless remote, but my a7R does not.What am I missing?? Tom, scroll in the menu all the way over to the toolbox and turn the Remote Control option to on. They moved it in the menu. The instructions for the Remote Commander are older than the cameras and are now inaccurate. Will this work, at least partially, with the new Sony A6000 camera? Thanks. 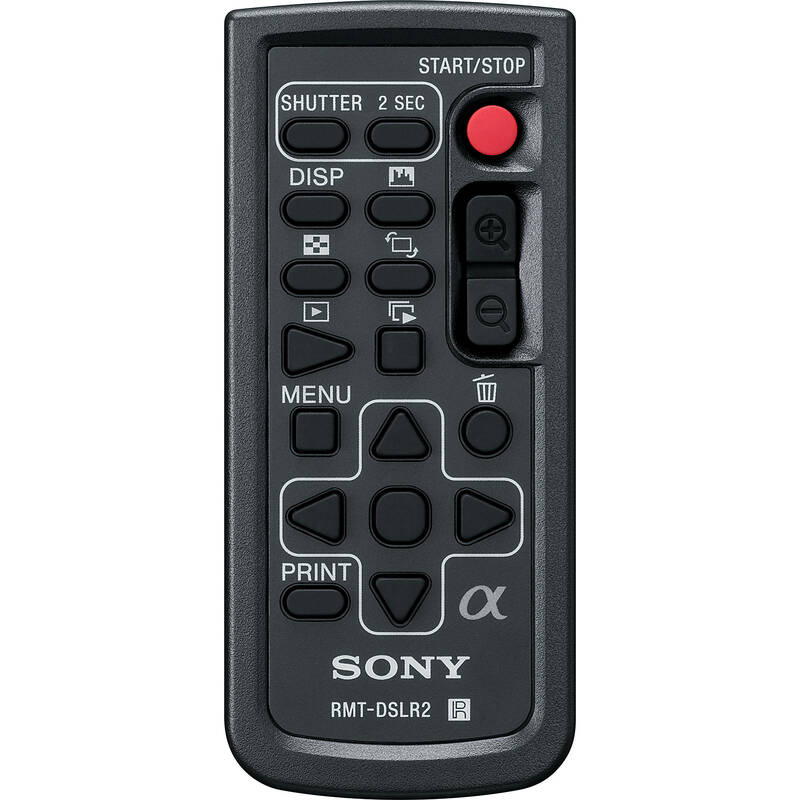 Yes, the Sony Wireless Remote Commander will be at least partially compatible with the Sony A6000. Is this compatible with Sony Alpha a6400? I cannot say. I use it with Alpha 6300. Can it be use for Nex 7? Yes, the Sony Wireless Remote Commander is compatible with the NEX-7. does it have bulb mode? The Wireless Remote Commander is just an IR based shutter release. There is IR (infrared) receiver in the camera. For stills you can trigger the camera instantly or with a two second delay. It also does some controls some video stuff too. But it s just wireless cable release. You set the shutter speed in the camera. All Sony A cameras can go up to 30&quot; setting. Longer than that you have to set the camera to Bulb and time it. And you would use Remote Commander to start and stop the the exposure when the camera is set to Bulb. It works very well. Indoors you can be a good distance behind the camera as the IR ray will bounce off surfaces. Outdoors you need to be to the side of the camera or just slightly off to the side and in front to it, because the IR receiver in A cameras is on the front of the body. The battery is lithium ion and last for years. And it is replaceable. Is there any way to stop the AF illumniator from flashing when the shutter is released? I have AF illuminator=OFF in both my a7R2 and a6500. Shooting Aperture priority, all still-image functions seem to work well except for that annoying orange light. If you have the self-timer on, the orange illuminator will still flash. Also, if you are using a flash in the hot shoe, the orange light will act as the light meter. Unfortunately, this remote is not compatible with the DSC RX-10. is this compatible with the a6500?